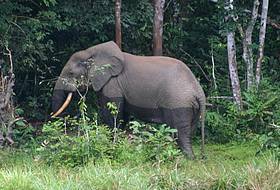 The WWF Jengi Tri-national de la Sangha (TNS) Programme landscape is situated within the Congo Basin forest eco-region, at the extreme southeast of Cameroon. The area is spread over three administrative units: Yokadouma, Moloundou and Salapoumbe with a surface area of 6,694 sq-km. 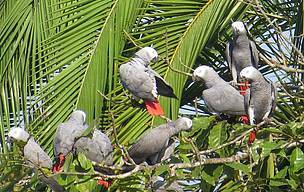 It is part of a three-country conservation initiative spanning Cameroon, the Republic of Congo and the Central African Republic. In July 2012, TNS became the first three-country transboundary area to be inscribed as a UNESCO World Heritage site. The Programme’s land use plan comprises one national park; Lobeke (217 854 ha), six logging concessions, four sports hunting zones, three community hunting zones, and an agro-forestry zone. 764 plant species belonging to 102 families. 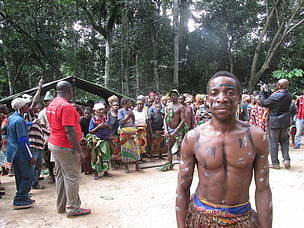 The Jengi TNS landscape is home to many indigenous ethnic groups who strongly depend on the forest for their livelihood. An estimated 23,245 people, of whom around 26 per cent are indigenous Baka, live in the area with agriculture, subsistence and commercial hunting, fishing and gathering of non-timber forest products being their main activities. We work with local communities and organizations and stakeholders such as the government of Cameroon and other NGOs to promote the sustainable management of biodiversity in the Jengi TNS landscape and contribute to better lives and livelihood for people.